Here’s a fast and delicious brownie recipe we whipped up this weekend using Chupon Mayan AND Chupon Mocha chocolate. (This is perfect for those who can’t decide which one to try…) For chewy chocolate brownies with a surprising kick, these will disappear faster than it took to make them! Preheat the oven to 400 degrees. Line the bottom and sides of a 13 x 9 x 2 inch pan with parchment paper. 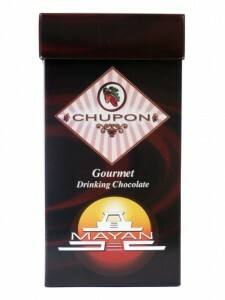 In a large bowl over simmering water (or dutch oven), melt 6 ounces of Chupon Mayan and 6 ounces of Chupon Mocha chocolate together, stirring constantly. Add 12 ounces of butter and stir until it is all melted together with the chocolate. Set aside and allow to cool for 20 minutes. Mix in sugar, then mix in the eggs one at a time, ensuring each one is blended in before adding the next. Sift in flour and fold gently. Pour batter into the prepared pan and spread into the corners. Smooth the top. Bake for 12-15 minutes or until firm to the touch. All to cool completely before cutting. Brownies that are moist inside will firm up once cooled.